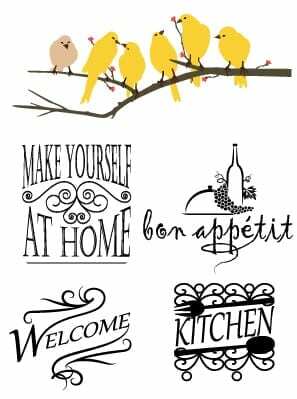 Retro Shirtz prints high end wall decals and stickers for all your home wall art decorating needs. All wall decor prices include our free wall decal design, which is the same as out standard standard graphic design. Our free graphic design services include suggesting and implementing fonts, changing the colors and layout of the fonts, and adding image assets from our database of over 20 million pictures and clip-art. All of Retro Shirtz wall art is printed on our high end industrial large format printer. We print in full color, and can die cut specific shapes and patterns with ease. All decals are printed on high grade solvent gloss adhesive sheets, produced by 3M. The material is rated 5+ years outdoor use, and will last indefinitely inside your home. Our decals are sold ready to hang, and include masking material, which makes installation a simple process. If applying to glass, wipe glass with a glass cleaner and dry completely. If applying to a wall or painted surface, clean wall of all potential buildup and dust. Use a leveling device to ensure a completely straight installation. If applying your wall art to glass, use a dry erase marker to create guide lines to mark your installation location. If applying to a wall or painted surface, use a pencil to lightly draw guide lines to mark your installation location. Preferably using 2 people and 4 hands, attach the top right and top left corners of the adhesive backing. Be very careful – do not attach the bottom half of your decal to your desired surface. Keep the wall decal taught. There should no bowing at the top of the decal – it should be flush with the wall. Once both top corners are attached, gently smooth & attach the entire top inch of the adhesive backing against the surface. Continue to hold the bottom half of the adhesive away from the surface. Slowly smooth the backing material against the surface in a downward motion. Generally, you will want to start at the middle of the decal and work outwards. Follow the shape of the decal and avoid the decal bunching together. Remember to keep the bottom half of the decal away from the surface. Any flat object, such as a credit card, is very helpful for this process. Once the backing material and decal are full attached, go over the entire shape of the decal a final time with medium pressure to ensure that it is fully attached. Gently remove the backing material, starting in one corner and peeling across the surface of the decal. If a portion of the decal remains attached to the backing material, stop peeling back, and reapply that section with medium pressure. Continue to remove the decal slowly, while being aware of any portions of the decal that may still be attached to the backing material. Repeat the smoothing process until the backing is fully removed. is built with a special lattice network of grooves on the adhesive side. These grooves allow you to gradually smooth air bubbles and pockets from underneath the decal, towards the decal’s edge. This allows you to smooth all air bubbles out of the decal.